If hot dogs are the Bonnie to your Clyde, the milk to your cookies, and the Han Solo to your Chewbacca - boy have we found the place for you! If hot dogs are the Bonnie to your Clyde, the milk to your cookies, and the Han Solo to your Chewbacca - have we found the place for you! 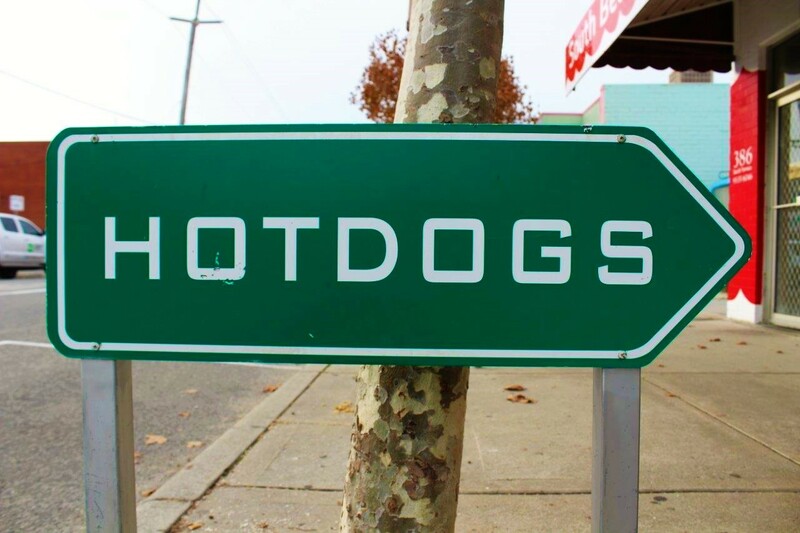 Head to the shop that will expand your hot dog horizons, where people understand your need for something greater than a home brand snag chucked on a slice of bread at Bunnings (although that’s still pretty great too.) 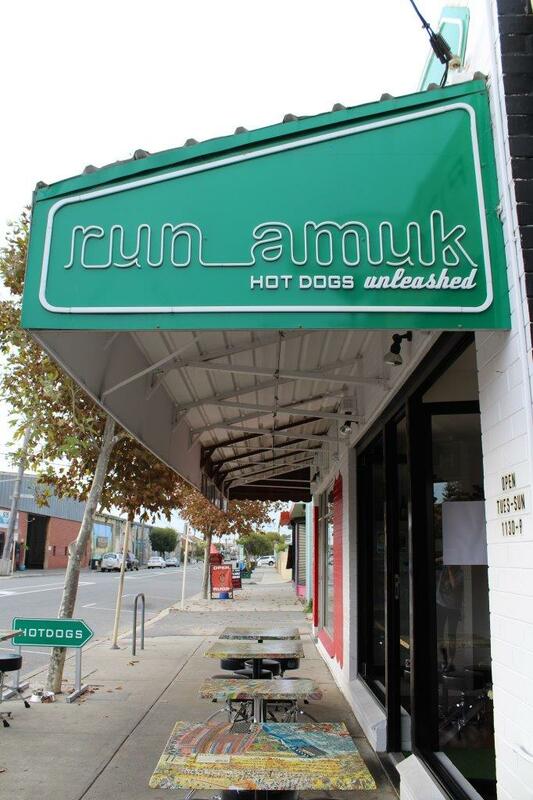 Head to the mecca of all things hotdog; Run Amuk: Hotdogs Unleashed. If you are vegetarian or vegan, you don't have to miss out on the fun with options to cater for everyone. Just like the hotdog, Run Amuk had humble beginnings. Owners Jodey Cordwell and Emily Mansbridge worked together in a gourmet burger shop to gain valuable experience while trying to save money for their own venture. 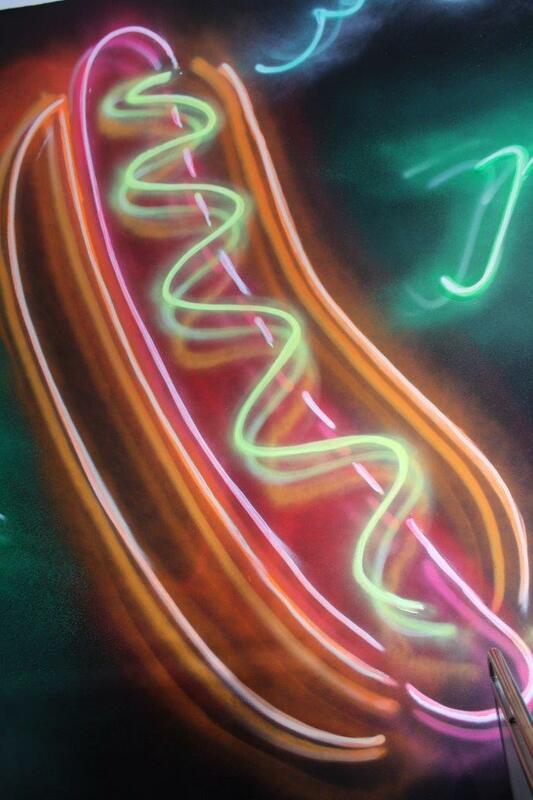 The idea for a dedicated hot dog store was born during a camping trip the couple took up north in a VW camper. Around a small campfire, the pair got to work cooking hotdogs and making a topping using anything and everything they had with them. In the pot went cherry tomatoes, red wine and grapes among other ingredients. Reducing it all down, they ended up with a tasty relish they smothered over the hotdogs. Simple but delicious, the seed of an idea was planted. From here they got the ball rolling towards the opening of their very own hot dog shop. Buying a small store on South Terrace in Fremantle, they kept their concept an absolute secret, blacking out the windows while the inside was completely transformed. 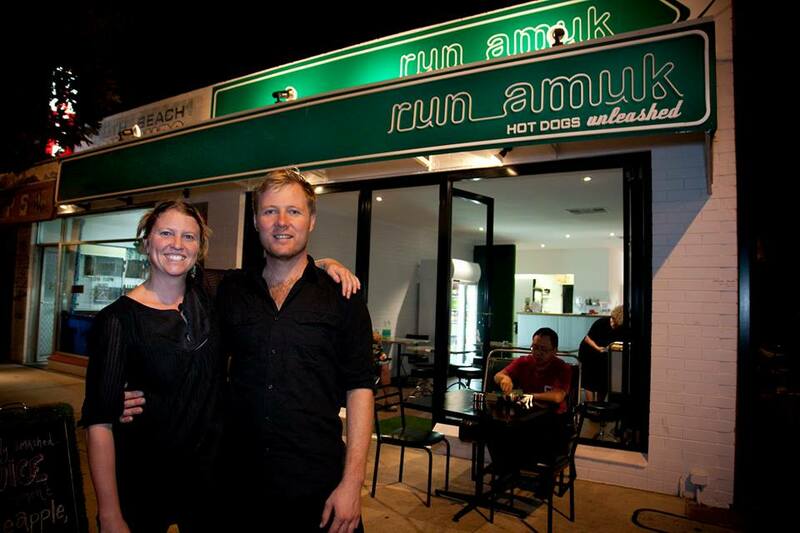 Opening their doors in January 4 years ago, they set about giving the people of Perth the hotdogs they deserve. Jodey says it has been a busy four years full of hard work, which will only become harder now that the couple have welcomed a baby boy! They are proud of all they have achieved and continually try and evolve their business and try new things to keep it interesting to both the staff and customers. One of the hardest tasks was settling on a name, with Jodey stating that they were so far involved with it that thinking of it was like thinking of their baby’s name- impossible! Luckily, his mother-in-law came up with ‘Run Amuk’. A little bit mischievous and a little bit naughty, they thought it really suited their personality and encapsulated their whole concept. The addition of ‘Hotdogs Unleashed’ as the full title explains their vision of letting them go, letting them have a new life and getting a bit more experimental than the traditional hot dog. 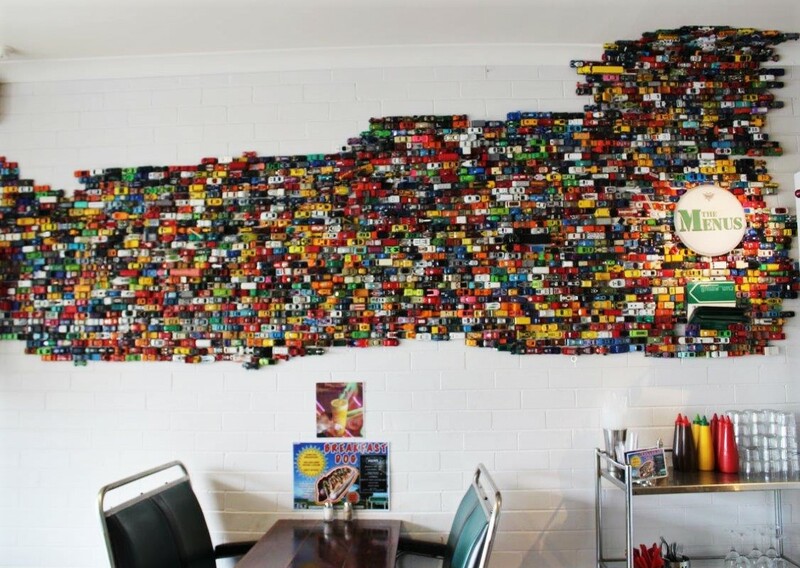 One of the first things you notice in the store is the amazing toy car artwork on the wall. This ongoing project was a concept Emily had wanted to create for a long time. The idea is to have a wall that is always evolving and something that customers can be a part of to create a personal connection to the store. 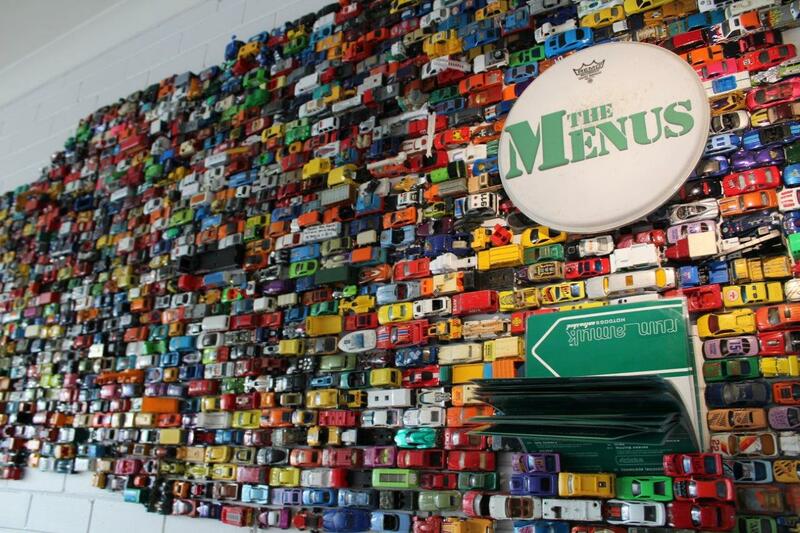 When visiting Run Amuk, customers big and small can donate small toy cars to add to the piece. It all started with one little orange classic beetle (that had lived its life on the Dash of Emily’s own full sized classic beetle) which is now joined by around 3,000 others. With each visit it will have grown, and they hope for it to eventually take over the whole store. Fitting out the shop themselves, they have injected their personality in the décor as much as possible. 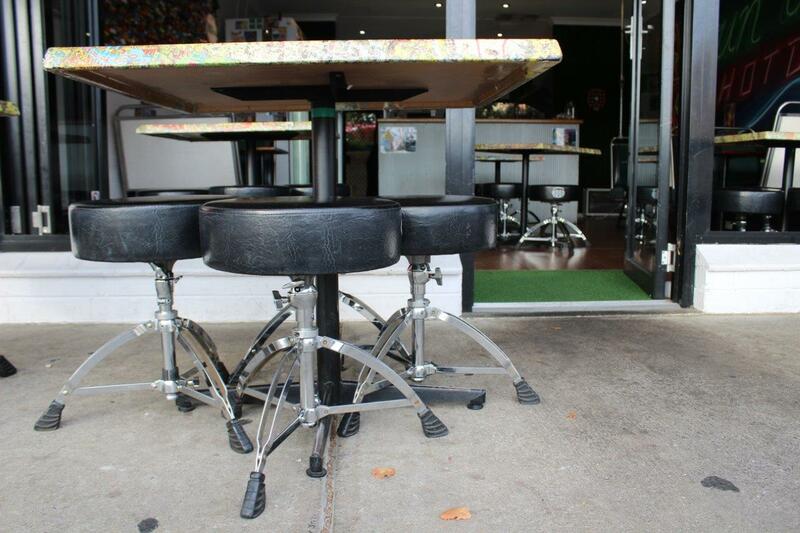 A drummer himself, Jodey came up with the idea to use sturdy drum stools as a seating solution for something a little bit different. 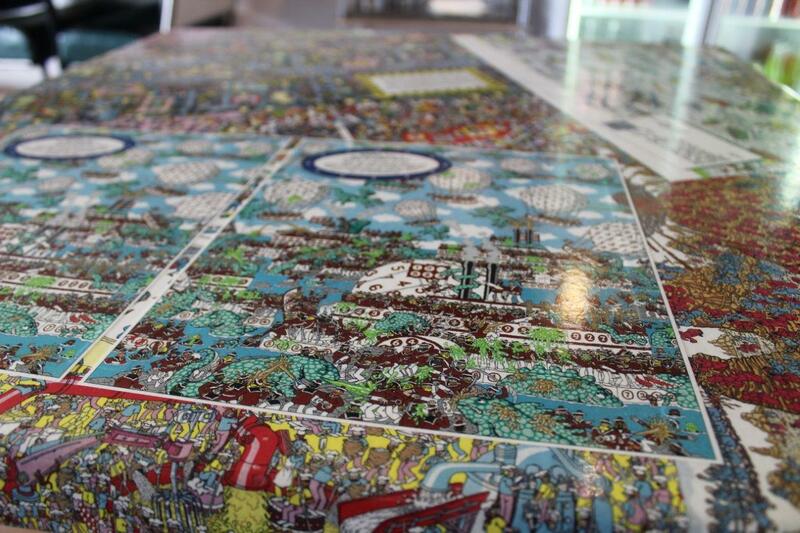 The tables are all decorated with images from Where’s Wally to keep kids, and adults alike, entertained. The neon street art decorating the other wall was done by a Perth street artist Muralist 8 months ago, after Jodey spied some of his work in Melbourne. With 12 different dogs on the menu ranging from classic to gourmet to dogs on fire (for those who like it hot, hot, hot!) there are plenty of options to choose from (who knew hotdogs could be so versatile?). Of course all these options can be served with their home made veggie and gluten free sausages (which are also vegan), that are designed to give the bratwurst a run for its money. According to Jodey, there are two top dogs; one being ‘the Punk’ and the other ‘the Rukus’. All start with a premium German bratwurst sausage, the Punk topping it with caramelised onions, cheese and bacon- a classic Aussie style hotdog that is apparently one of the most popular (because bacon). 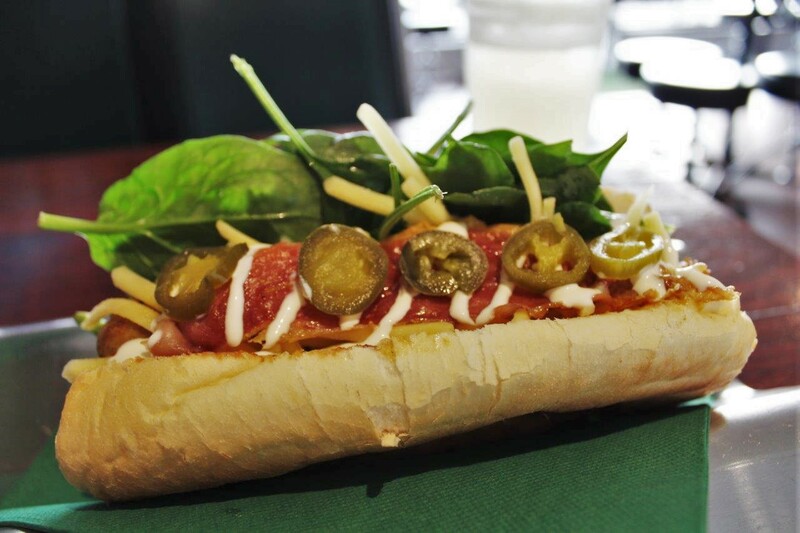 The Rukus offers a different kind of twist on the hotdog, loaded with baby spinach, chili lime sambal sauce (a beautiful thick chutney which is the perfect balance of spicy, sweet and sour), prosciutto, cheddar cheese and jalapenos. This was my dog of choice - delicious and not for the faint of heart with its spicy kick. If you are really game, you can go for the even hotter ‘dare devil’ with jalapenos, harissa, baby spinach, caramelised onions, cheddar, habanero chili sauce, sour cream and fresh green chilli- it’s sure to blow your top off! To keep you on your toes, Run Amuk often do special dogs that last a limited time- recent examples include the breakfast dog with all the usual breakfast items stuffed in a handy bun, and before that, the sushi dog; stuffed with rice, pickled ginger, Japanese mayo and pineapple relish. Although you may have missed out on these delicious creations, you can look forward to the next special that will pop up in the next month or so. Something Jodey says he has learned is that you really can put anything on a hotdog - leading to endless combination opportunities. 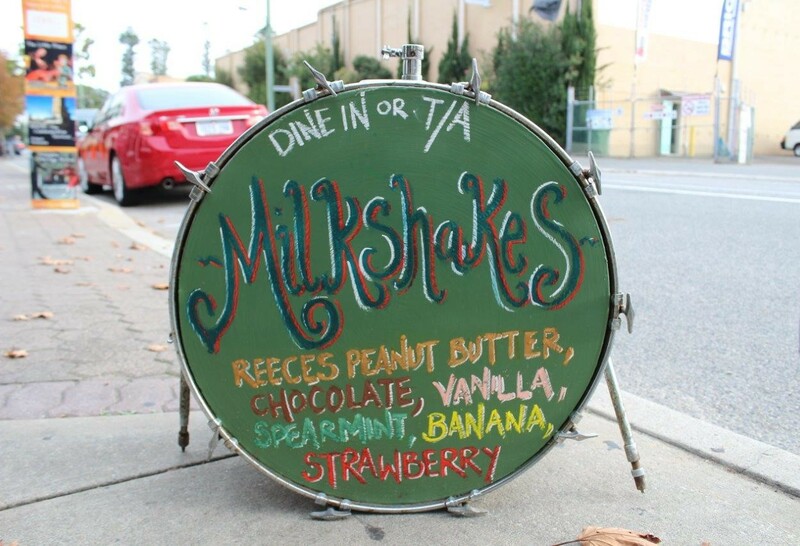 In true American style, you can enjoy your hotdog with a delicious milkshake, the delectable Reeces peanut butter choc shake (for a real food coma) or the wonderfully fresh homemade lemonade. Something to really get excited about is Run Amuk’s fourth of July party. This massive day will see the launch of the special Chili Con Carne dog and the shop and staff decked out in all things American. With $1 milkshakes and a no hands hotdog eating competition make sure to save the date! 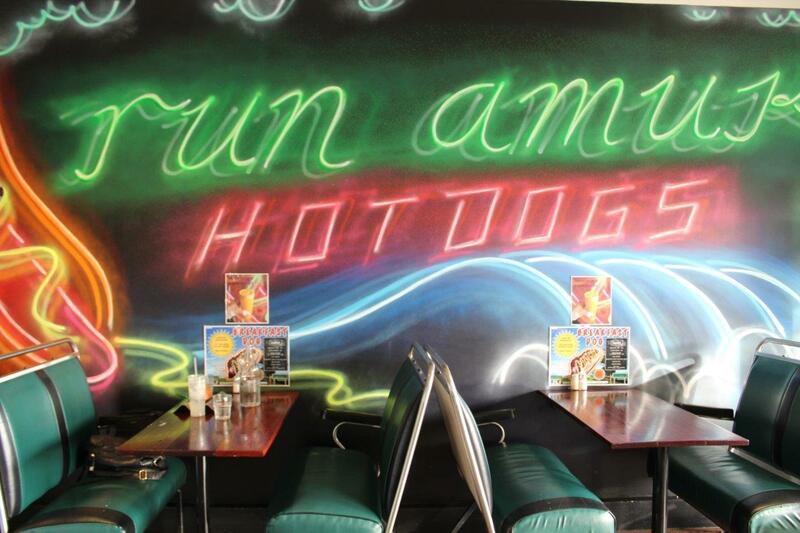 Open Tuesday to Sunday 11.30 am to 9 pm you can stop by whenever your hotdog cravings hit!